After all the time it took me to complete this review, I felt like Greek hero Odysseus - presumed dead when he took so long to return home after the 10-year Trojan War. I thank Bastanis and our readers for their patience. News of my death at Troy were far exaggerated. What took so long? These are not speakers just shipped and plopped onto a listening room floor. Since they are essentially kit speakers, I had to find the best baffle design for my taste (there are numerous options), identify an economical and skilled woodworker, then assemble the speakers. Add to that a protracted battle with a kidney stone, then a sprained knee and I finally I did feel just a bit like Odysseus. As a fan of single-ended triode tube amps, I always look out for good high-efficiency speakers to mate with them. Ten years ago and more, many of my fellow SET devotees perused James Melhuish's apparently now defunct single-driver website for the latest developments. It was the repository to follow for the latest designs and ideas about both high-efficiency and often single-driver designs. At the time, much of the talk was about Lowther, Cain & Cain, Omega, Hammer Dynamics, PHY & Bros. In the ensuing years, many other brands added themselves to the list of usual suspects: Zu, Tekton, WLM, Teresonic, Fritz, Fostex, Tang Band, JohnBlue, Suesskind, Manger, Voxativ and more. Amongst the high-efficiency designs that departed somewhat from the strict single-driver approach were Robert Bastanis' eponymous line of speakers. They are circa 100dB open-baffle speakers which pay homage to the spirit of the single-driver aesthetic. The heart of any Bastanis is their proprietary widebander which covers the 100Hz to 11kHz bandwidth. This driver is sourced from Eminence, then treated with Robert's proprietary process of baking in violin lacquer applications to stiffen the cone in specific areas and extend its upper response. 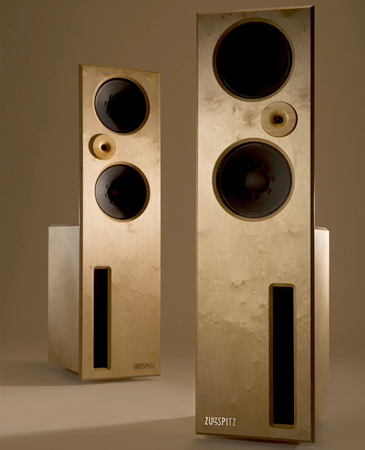 For more information, read the explanation given in my 2006 review of the Bastanis Prometheus MkII speakers. Where Robert Bastanis deviates from the purists is by adding a tweeter and woofer to arrive at a 3-way design. However, the majority of the music is still reproduced by the widebander. Moreover, that core driver runs wide open without filter to allow the purity of the music through unsullied. I was immediately drawn to this more pragmatic approach as long as the tweeter and woofer did not unduly distract from the essential single-driver experience. Most of the single driver designs I had heard could not really do justice to the demands of large-scale orchestral or Rock so the addition of the woofer and tweeter appealed to me. After my 2006 Bastanis review ending in a Blue Moon award, I purchased a used pair and enjoyed it ever since, admittedly only sporadically due to the poor heating and cooling of my listening room above the garage. Since upgrading to a new heating system, I have been able to make this upstairs room my main listening room which increased my listening time with the Bastanis. With this move to what now is also a better sounding room (it includes various acoustic treatments), I decided to upgrade the original Bastanis Classic widebanders to Robert's new and much improved Chrystal units. Robert refined his treatments to the Eminence drivers to produce increased detail and clarity as well as improved tonality. Bastanis owners should not hesitate to pursue this upgrade if they have not already done so. It is a very worthwhile investment. Soon after installing the upgraded drivers, Robert inquired whether I would be interested to review one of his new speaker designs, the rear-horn Wildhorn. This was aimed at audiophiles whose rooms were unsuitable for the open baffle models (e.g. not deep enough to pull the speakers sufficiently out from the front wall, or with too much glass there) and to open up Bastanis to a wider market. Unfortunately, the Wildhorn's downfiring bass horn refused to properly couple with the floor and front wall of my room which was supposedly due to my suspended wood floor above the garage. Hence said review's outcome was deemed less than optimal. It was decided that I should follow up reviewing the Bastanis Mandala open baffles. Robert has always supplied the majority of his speakers as kits. Those consisted of the drivers, resistors and caps whilst the baffles/cabinets were to be built by the customer using plans from the Bastanis website. Robert also had global distributors who supplied kits to buyers in their respective countries. 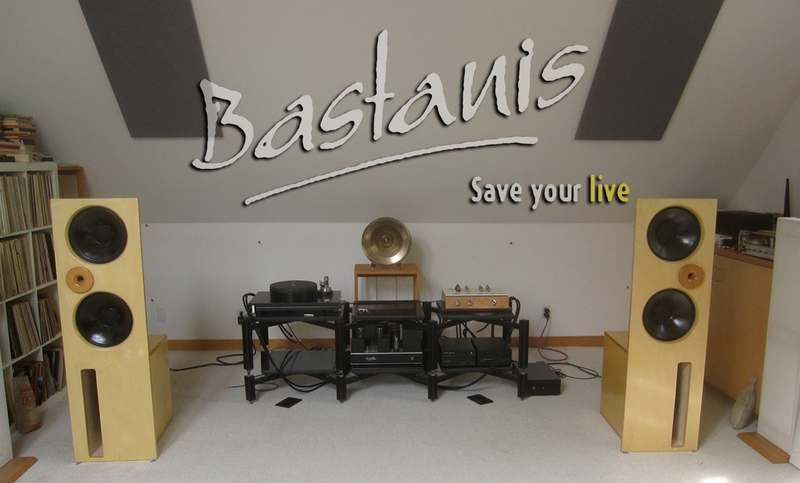 However, beginning in the summer or autumn of 2016, all Bastanis speakers will be sold by distributors/dealers who will supply everything and hence will also have a woodworker at their disposal to supply turnkey baffles and cabs. The Bastanis Mandala uses the same 12" Chrystal widebander as the Prometheus MkII. Where the latter have a single Chrystal per side, the Mandala has two. Both models employ the Gemini compression tweeter. In the Mandala, that is mounted between the widebanders in roughly an MTM array. The 8Ω widebanders are wired in series for a nominal 16Ω load and run without a filter. A single 1.0µF capacitor serves as high-pass filter to the Gemini tweeter at 11kHz though the decreasing response of widebander and tweeter meet acoustically at around 8kHz. Finally there are two long graphite resistors wired in parallel across each widebander to "...flatten the impedance for tube amps. They also take out some energy in the upper midrange and, important for the Duo baffles (models using two widebanders per side), help together with the series wiring of the drivers to make the drivers behave 100% equal to each other and get a unique wave front. The resistors have a 12Ω value for the Classic drivers and are 15Ω for the Chrystal." There are several options for bass – powered sealed-box 12"/15" woofers and the top-line Ultimate 18-incher in a folded open baffle. The latter were supplied for review. When Robert first emailed me about the strengths of the Mandala over the Prometheus, he claimed more dynamics, a fuller midrange and that his brand-new largest woofers in the open-baffle cabinets were amazing. That was enough to whet my appetite. His Canadian distributor/dealer Mark Loewen of Peacenik Audio supplied the woofer cabs with the drivers already mounted. These are an upgrade over the original 18-inch units. While they offer better performance, they are also more demanding of power and crossover settings. I was able to get the front baffles made by a local friend whose basement is a dedicated wood shop. I followed the one-piece front baffle design of Zugspitz speakers that use Robert's drivers in all-out more expensive designs. Their model equivalent to the Mandala would be this Zugspitz Anmut Duett at right. My friend special-ordered high-quality 1" Baltic Birch ply for my baffles. This is typically not available from neighbourhood wood suppliers.